Towards the southern end of the Bay of Naples is the seaside town of Sorrento, which has swapped its old style fishing village roots to become one of the most popular destinations for tourists on the Neopolitan Riviera. Here you will be able to relax away from the hustle and bustle of city life, while still having the opportunity to reach Naples in a matter of minutes thanks to the Circumvesuviana rail system, which links the two towns. The ancient town of Pompeii sits only a short distance away and so does the infamous Mount Vesuvius, which did the damage all those years ago. The town is one of the world’s most important historic locations, so a trip here really wouldn’t be complete without a visit or two. Excursions are available to Pompeii and boat excursions are also available to the nearby island of Capri, which is a must see during the summer months. The town may be small compared to nearby Naples but there are surprising number of shops, restaurants and bars where you can have a great time when the sun starts to go down. Make sure that you bring your sun cream along during the summer months, as the average high temperature can get to around 29 degrees Celsius with highs easily exceeding the 30 degree point. With skies remaining very clear throughout summer, you’ll need to take extra care when exploring the streets or sitting on the beach. We’re sure you’ll get your Italian summer tan in no time! The ancient site that is Pompeii has become a world famous destination for those who love historic sites. The city was buried under boiling volcanic ash when Mount Vesuvius erupted and talented archaeologists have since uncovered what remains. You are free to explore the city and if you want to get up close and personal with the volcano that caused all the trouble, excursions to Vesuvius are also available. This amazing nature reserve covers both land and sea, protecting certain areas while still allowing visitors to experience the natural wonders within. Although parts of the sea are highly protected with no access allowed, some parts allow motorboats and also diving tours, giving you the chance to see the nature not only above the sea but also below it. Located within a beautifully designed villa is where you will find the selection of artifacts that dates from the Roman period all the way back to the Prehistoric! You are sure to love the Roman sculptures and the views from the villa itself are simply amazing! The naturally beautiful island of Capri is said to be the home of the Sirens, who would lead sailors to their deaths. Thankfully this is just a myth and the island is nothing but good with beautiful natural sights, numerous hiking trails, a chairlift that takes you from Anacapri up to Mount Solaro and plenty of places where you can enjoy a calming swim in the sea. On the northern end of the Bay of Naples is the huge Italian city of Naples, a real gem if you’re looking for cultural attractions and historic architecture. With huge castles, impressive galleries, many restaurants, an excellent nightlife and markets that will have you browsing for hours, the city is one of the most impressive attractions on the Neopolitan Riviera. Explore the Bay of Naples by taking a boat trip across the water and venture to one of the nearby islands for additional adventures. The island of Capri can be found a short distance from Sorrento’s beautiful cliff top location and if you head north, you will come to the island of Ischia, which is home to many beautiful sandy beaches. There’s nothing more energising than a refreshing bike ride in the Italian countryside. Hire a suitable bike and start peddling around town and out into the beautiful surroundings. Whether you want to stay close to the centre of Sorrento or venture along the bay to Naples, how far you travel and where you go is completely up to you! The one thing we know is that once you start peddling, you’ll find it hard to stop. Guided tours are available to some of the main attractions in the surrounding area. These are a great way to ensure that you don’t miss a beat and that no detail is overlooked. Book a tour of Pompeii or one of the other nearby sites, including the city of Naples, which houses a wealth of historic and cultural sights. Sorrento’s cliff top location won’t stop you from enjoying a swim in the bright blue waters thanks to the selection of beaches that are nearby. From these lovely shores is where you will get the chance to take a dip in the sea for a well-earned swim and the kids are sure to love paddling in the warm water. The town may sit high above the sea on an impressive cliff top but there are still a few beaches within walking distance. These are worth travelling to if you want to catch some sun in front of the beautiful blue waters. This quaint little beach may be on the small side but will definitely do the job, if you’re looking for a spot to soak up the sun in peace. It’s relatively easy to access from the top of the cliff and there is even a lift you can use for a small fee for those who don’t fancy challenging the stairs. Marina Grande This is another lovely sandy beach, which is only a few minutes walk from the centre of town. The bus can also take you here if you would like to keep walking to a minimum and once you arrive you won’t want to leave again, as the waters are simply irresistible. As the most attractive of the beaches in Sorrento, Punto del Capo is also one of the most popular and for good reason. The waters are perfect for families with small children, as they are shallow and calm close to the shore. 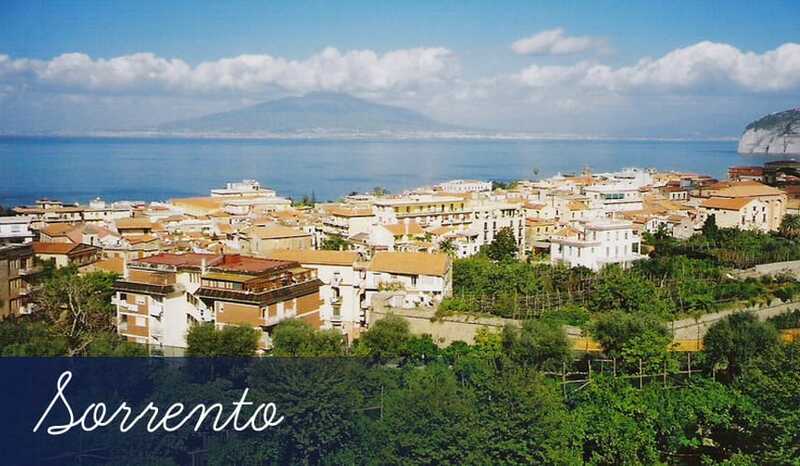 As soon as you arrive in Sorrento you will notice the superb selection of restaurants that line the streets, from the edge of the cliff to the centre of town. Like many of the restaurants on the Neopolitan Riviera, only the freshest ingredients are used including fresh seafood caught just offshore. Ristorante ‘o Parrucchiano boasts an amazing menu filled with delicious seafood, such as mussels and lobster. They are of course freshly caught but if you’re not a fan of seafood then try the pasta dishes that the restaurant is also well known for. The ravioli is simply delicious and the cannelloni is also pretty amazing. If you prefer pizza, head over to Villa Rubinacci, a quaint little pizzeria offering freshly baked pizzas with numerous topping options. Other restaurants in the town include Inn Bufalito, which specialises in buffalo meat and cheese fondue. Ristorante il Buco focuses on local cuisine with the fresh seafood boasting a beautiful setting inside a monks former wine celler. Mondo Bio is the perfect place for vegetarians and vegans, with tofu and soups among the popular dishes. Best of all, it’s all organic! You will be pleasantly surprised when it comes to nightlife in Sorrento, as there is a fantastic mix of traditional charm with modern bars. Although it’s not the place to come if you’re looking for a clubbing holiday, it still offers plenty of bars and pubs with welcoming atmosphere and a superb selection of cocktails and beers for all to enjoy. If you don’t fancy a drink, you can still enjoy the lively atmosphere by simply walking through the streets from one end of the town to the other. If you’re after a good pub, you won’t be short of options. Chaplin’s Irish pub has been around since the 70’s and is said to be one of the best in the town. It’s a great place to socialise and the selection of beers available is sure to impress. The Kiosk Bar is the place to be if you love sport, as the big screen TV usually shows the latest matches with what is said to be some of the cheapest drinks in town and a good section of snacks! The Banana Split bar is another perfect place for watching sport on a big TV but also great if you’re looking for a snack such as pizza or toasted sandwiches. It’s family friendly and there’s even live music here throughout the week. If you prefer to party, head over to the Fauno Notte Club, which boasts a brightly coloured modern interior. There’s plenty of places to sit and chat and also plenty of dance floor when you want to show off your moves. The central square of Piazza Tasso is the perfect place to start exploring the shops, as it will lead you outward, allowing you to find them much more easily. The street of Via Cesareo is known as the best shopping street in the town, which joins onto the square. Once you start walking along it you will soon come across a good selection of shops and stalls selling a number of varied products including leather shoes and inlaid wood, which is when different types of wood are cut into shapes and laid together forming a unique shape on a flat surface. These wooden items have become a trademark of the town, making them ideal souvenirs. You will notice a huge number of impressively sized lemons for sale. These grow in the hills around town and are perfect if you’re thinking of doing some cooking or even making lemonade. The strong Italian sun, helps them grow to this large size and get super juicy! There is even a local alcoholic lemon drink called Limoncello made from these monstrous lemons, which definitely has a unique taste to it, so why not try it? Hand painted ceramics are also a popular item here in Sorrento and hand made jewellery is too! There are plenty of opportunities to buy antiques also, as well as clothing shops and local stores where you can pick up the holiday essentials.